Raw and SmackDown Live have somehow been littered with free agents since the most recent NXT call-ups. The presence of Aleister Black, Ricochet, Lacey Evans and Heavy Machinery on both main roster brands has been exciting yet somewhat of an undoing of the brand extension that was brought in two years ago. Raw and SmackDown should be seen as completely separate entities, with their own individual hierarchies and meritocracy. Seeing Black and Ricochet challenge for both brands’ tag titles within a week is a little jarring — plus having Becky Lynch hold onto both women’s titles at once — really discredits all the effort to make them seem like two opposing halves. Now that the Superstar Shake-up is on the horizon, it’s time we give these newcomers a permanent home, along with some of the most recent returnees. Nip this in the bud before it’s too late to return to the exclusivity of being on one brand, either that or do away with the brand extension and go back to having a free-for-all across both Raw and SmackDown Live. Regardless of what road WWE want to go down, here are our thoughts on where each free agent should go. The former NXT Champion has been one of the two newcomers to make the biggest impact on the main roster so far. Black and Ricochet have made quite an interesting duo that found themselves elevated in the tag division to the point of having three title matches throughout WrestleMania week. Pretty impressive stuff for two guys that have just been called-up to the roster, usually they’re bogged down in a Dolph Ziggler feud in that time. As much as I like the pairing, it’s time for the two to go their separate ways. Aleister Black in particular is far from a tag team performer: he’s his own brand and should be allowed to develop into a dominant singles threat. WWE seem to be pushing hard on the ‘creepy’ nature of Aleister Black’s character, therefore I think he’d be better suited to Raw, where the more campy, cartoonish style seems to favoured over ‘rasslin. I’d love to see Black start off with some big feuds with the likes of Drew McIntyre, Bray Wyatt and Roman Reigns, all currently Raw superstars. Give him some big wins under his belt, should they be willing to go all the way with Black as a champion of the new generation. Either way, they should allow both he and Ricochet to shine as individuals, and the best way to do so is to split them up. So naturally Ricochet should be sent packing to SmackDown Live. The high-flyer has already won over the majority of the mainstream audience with his innovative offence, but has only begun to scratch the surface with his potential. Having only managed to capture the North American Championship on NXT, it’s time for Ricochet to be allowed to excel as part of the blue brand, perhaps even be given a run at the United States title in the near future. 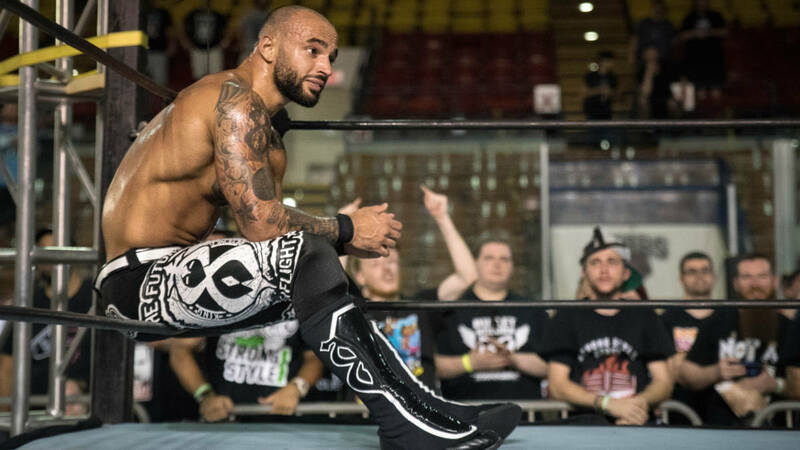 Ricochet has the potential to be a huge star for SmackDown going forward, a brand typically known for giving out opportunities to up-and-comers. Getting to see Ricochet involved in the same scene as Rey Mysterio, AJ Styles and Samoa Joe could make for some fantastic dream matches. I think if Ricochet is going to start anywhere, he should be given a feud with Andrade. If anyone’s going to let Ricochet display his mastery of various in-ring styles, then it’s him, and it would make for a really interesting match as well. Just not 205 Live please. As per my previous article on who should be drafted this year, I think it would be a safe bet to get all of SAnitY together on one brand. Nikki Cross has been acting alone since Eric Young and the crew were called up last year, granted not to much success, so maybe Nikki was the missing X-factor that could finally lead to SAnitY making the most of their main roster run. Cross hasn’t really made a mark on either brand just yet, but remains one of the most intriguing and popular call-ups out of the latest batch. Here’s hoping that she won’t just fall into the background like her stablemates and make something of herself as part of the unit. It’d be cool to see Nikki being presented as the leader of the faction rather that just another member of SAnitY. The last thing WWE want to do is pass that status (or lack thereof) that the trio have onto Nikki Cross, a relatively hot product for the women’s division. SmackDown’s tag division really peaked with The New Day and The Usos’ rivalry, other teams have sort of meandered about the titles but haven’t really seemed like much of an addition to the scene. Most of the teams are either odd couple pairings like Nakamura and Rusev or partnerships made for storyline purposes, i.e. Miz and Shane McMahon. It’s time for a traditional tag team to be added to the fray, and that should be Heavy Machinery. I’m a big fan of Otis and Tucker, the throwback blue-collar gimmick works as a fun addition to the roster that sometimes takes itself a little too seriously. Do I see Heavy Machinery ever really making it to tag title glory? Not really, but they should make for an entertaining part of Tuesday nights, even if just for comedy segments. Machinery have had some fairly big wins on Raw, defeating the entire undercard of the Raw tag division in a gauntlet match, so if anything, it proves that they’re at least considered more than just a couple of enhancement workers. 5 Star Lars has arrived after months of lurking backstage. Sullivan made a huge impact on the Raw after WrestleMania, attacking Kurt Angle after his farewell speech and then going on to beat up both Hardys on SmackDown Live. It seems like Lars is going to be considered a massive threat to whichever roster he finds himself a part of this week, so here’s hoping that it’s going be worth the months of waiting and video packages. It’s hard to put a finger on where they’re going to go with Sullivan. Originally pencilled to be feuding with John Cena heading into WrestleMania, they’re now having to start from scratch at the top of the new season. I think if Lars should be put anywhere then it should be Monday Night Raw. If Braun Strowman is hanging about, then it’d be great to see the two hosses in the ring together at some point. I see fairly big things for Lars in the near future. If the rumours of him being considered worthy of a Mania confrontation with Cena were true, then surely someone must be a big fan of Sullivan. Sami Zayn has returned to the WWE, bringing a new anti-fan attitude with him. It’s hard to disagree with some of the things Zayn has been saying as of late, putting the blame on the toxic nature of fan culture and our general cynical attitudes towards what’s happening each week. Zayn was unfortunately injured during a fairly successful tag run with Kevin Owens, who also made a comeback quite recently. It’d be interesting to see the two best friends pick up where they left of and go for the tag titles, or maybe even restart their legendary feud. Zayn seems to be a lot more comfortable playing a version of himself turned up to 11, let’s hope that Sami makes it further than ever and breaks into the main event scene with this new gimmick. If he’s going to do it anywhere, then it’s going to be on SmackDown. The Raw women’s division has lost a big player in Ronda Rousey. It’s time for a few new faces to come in and fill the gap left behind. Lacey Evans is primed to be a big star in the new age of women’s wrestling, so who better to step into those shoe? Evans has finally started teasing an in-ring feud with two very big statements made towards Becky Two-Belts. Whether or not she’s deserving of a title match right now, it’s nice to see her do something more than just walk up and down the ramp. Benjamin had a quick cameo on Monday Night Raw a few weeks back to face Seth Rollins, but since then he’s once again faded away into obscurity. The idea of Shelton being Brock’s full-time representative alongside Paul Heyman made for quite an intriguing concept. Should Lensar be hanging about for another tenure, then it’d be good to have his presence felt via Shelton Benjamin, an athlete similar to that of the Beast Incarnate. Shelton’s name does hold value, but unfortunately it’s not enough to keep him on television on his own. Putting him with Paul Heyman would possibly be the best invigoration to his career, getting him back on screens and involved in some fairly high profile feuds.